This post just happens to be the 100th for “Throw the Dice” and hey, why not do something special to mark the occasion? So I’m shaking things up going into the next 100 posts. A review here and there might pop up, just to keep you readers on your toes! Don’t worry though, my original writing M.O. isn’t going anywhere. 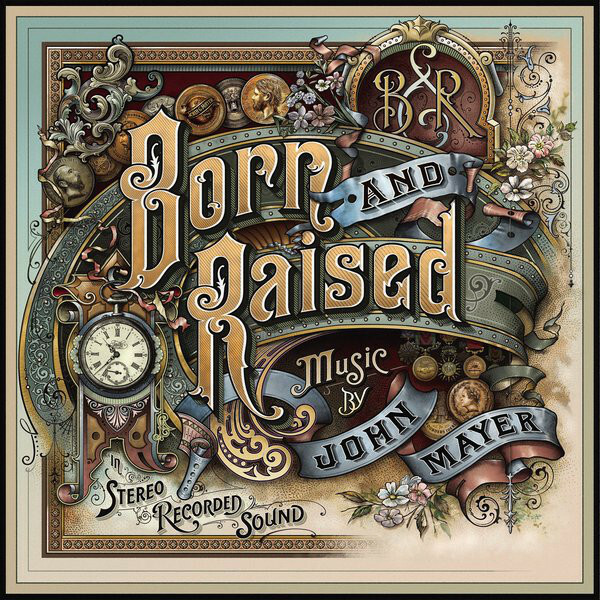 John Mayer‘s new studio release, his fifth, is titled “Born and Raised” and officially hit the download queue and store shelves this past Monday, the 22nd. What’s being buzzed around the internet as ‘John Mayer gone country’ can certainly be filed under Americana, Folk and does have aspects of typical country in it. A fully loaded 12 song record, the track list is below, as well as the first track, courtesy of Mayer’s official VEVO channel. Now, this isn’t a flat out album review. I’m more taken in by Mayer’s drive behind the record and compliment these declarations with praises for the songs. It’s my opinion that this album can be listened to many consecutive times -not just because one might like it but because each repeat can highlight something else both profoundly emotive and expectedly accomplished. Summarizing the whole picture, this work is both incredibly straightforward; (bordering on cliché) and rather (pleasantly) unexpected. Without deconstructing every single syllable, the semi-cliché nature I’m talking about is clear from just the lyrics. (Though is cemented in so much more by following interviews alongside.) Mayer is allowing us to hear real things that happened to him and real things he thought and felt along the way. Just the opening verse from “Queen of California” when you first hit play makes this narrative format crystal clear, even if you never plugged into the hollywood chatter around Mayer’s life outside of his CDs. Goodbye sorrow and goodbye shame. Just because I used the word cliché, I don’t mean to imply that as a negative. Any lack of mystery in lyrical composition only serves to reinforce this idea of Mayer sincerely bearing a transparent and evaluative spirit this time around. To briefly mention his last release, Battle Studies, real life connections could certainly be made from there. Consequently, it’s not as if the content was any less factual but aside from Battle Studies mentioning real events, by comparison, Mayer’s newest content speaks truth, substance and change. What I just said may seem like an obvious statement as glaringly bright as the sun, seeing as how ‘country John’ has caught many off guard, to varying degrees. However, to address this detail specifically, the very fact that Born and Raised sees Mayer in yet another box, seemingly packaging his albums in a new genre every release, speaks volumes to his technical changes as a musician. To jump ship abruptly and so largely to another style is unusual because if each were so easily picked up, everyone would know how to do everything. Opera singer, Renée Fleming’s, venture into indie rock with “Dark Hope” is a prime example of a greatly skilled artist occasionally being at a loss because the singing style is so unlike anything she’d had to do up to then. John Mayer removes this line of thinking though and stands modestly like a rare exception to the rule, because he never let the rule take him in, in the first place. (Perhaps I speak too quickly of “rules” though, as these days the mass trend of collaboration makes genre defiance a little less shocking.) Mayer’s guitar prowess and genuinely individual but memorable voice fit into many molds. Simultaneously, there are definitely things both artistic and technological that make Mayer have his ‘signature sound.’ His particular guitar and chosen pickups can be recognized from album to album, as well as certain gently emulated hooks and rhythm patterns. In this way, Mayer has something extra special, in that the things we can recall and retain from project to project are things that identify him and his strengths specifically; not necessarily the genre communit(ies) surrounding him. To get back to what I said before about change in a less obvious way, there may have always been honesty in Mayer’s older work too but the heavier impact of outright soul bearing is unavoidable and truly sets Born and Raised apart because he has taken a stance behind and within the album, of proclaiming inner growth and maturity so intense and important, there is no turning back. In turn, this means that besides hearing new words in new songs, each track illuminates the mentality of a changed man, who has settled into his skin of adulthood and all the admirable qualities it brings. This element is new in a way that no crazed fan could possibly leak out to the internet. There’s risk, there’s vulnerability, there’s even a touch of momentary randomness, but, I don’t need to spell the verses of every track out on the page for you. That would deprive you of so many moments of intrigue. I’m still enjoying this new CD for the many reasons that I believe it can be put on repeat. Even more than the record itself though, I think there’s a bit of basking that can be done when you fully process just how intimate and revealing Born and Raised is. Mayer might be far from the first person to have the kind of maturing revelations he’s singing about but, if being witness to a man really coming into his own isn’t the ultimate fan to celebrity admission then let’s see 140 characters and an “@” symbol shed light on inner demons with the same amount of refined depth and exclusivity. Give the album a listen and feel free to agree, disagree, and share your opinions on anything I’ve said and let’s see what comes of it. Happy listening!